Just last week they released their EasyAnatomy BETA to veterinary students around the world, signed multiple schools to the Design Partner Program, and closed a substantial private equity financing round! and they were one of 10 startups across Canada to receive the 2015 Futurpreneur Spin Master Innovation Fund. They’re absolutely ecstatic by the amount of support they’re receiving both locally, and from schools and students abroad. 2016 looks very promising for LlamaZOO! 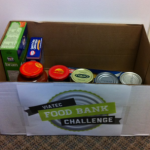 VIATEC Food Bank Challenge Participants! Our Tectorians of the Week are: Arpix Media, Avocette, AXYS Technologies, Carmanah Technologies, FTS, Isolation Network, Planet Clean, Red Brick Media, Revenue Wire, Smart Dolphins IT Solutions, Simply Rooted Media, Schneider Electric, StarFish Medical, UNIT4, Vigil Health Solutions and xMatters! Why? 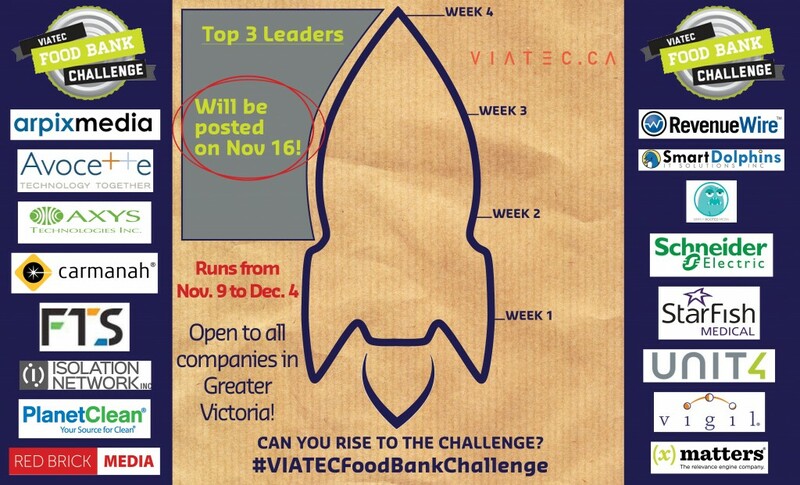 Because they’re all stepping up and raising cash and food donations for the Mustard Seed Food Bank through the VIATEC Food Bank Challenge! Week 1 of 4 is just wrapping up today and although VIATEC won’t be posting results until Monday, we can tell it’s been a very active week. The announcement that Dan Gunn, CEO of VIATEC, will get a tattoo of the VIATEC logo if $100,000 is raised, may have upped the ante a bit! It even caused Dallas Gislason of the GVDA to raise the stakes by offering to do the same if $110,000 is raised! Arpix Media also submitted $500 on the very first day! Red Brick Media went with a video instead of a picture in order to capture the action of their team doing push ups! Today’s #FBC: Bring Sally Up #pushups! 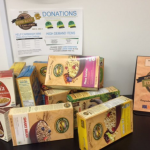 We’re fundraising for @mustardseedvic, so stay tuned for your opportunity to help out! 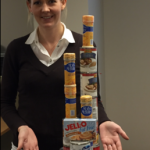 #FoodBankChallenge #Viatec #yyj #getyourgiveon! 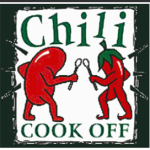 Want to donate to one of the participants to help them win? See the company list above or below! Want to just witness all the fun? 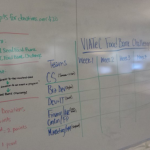 Search for #VIATECFoodBankChallenge on social media! Dave Green, local serial entrepreneur, was sailing the seas in 1996 and enjoying his favourite hobby, when he kept having the same dilemma… he was repeatedly draining his sail boat’s battery by leaving the masthead light on. His internal light bulb turned on and he got the idea to create a solar self-contained LED light (inclusive of battery, light and power source) which could be used by mariners. Still existing nearly 20 years later, Carmanah has established an industry-leading portfolio of rugged, reliable and marine lighting products, and is an established and trusted supplier to Coast Guards, marine authorities, navies and ports around the globe (110 countries in total)… and they’re based right here in beautiful Victoria, BC. Specifically, they design, develop and distribute energy efficient LED solutions for infrastructure including: signalling systems for the marine aids to navigation, airfield ground lighting, offshore wind marking, aviation obstruction and traffic markets. Most recently, Carmanah completed the acquisition of the Sabik Group of Companies. 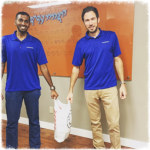 Sabik had been a strong partner to the marine aids to navigation division since 2010, and they are happy to welcome them aboard the Carmanah team. This acquisition combined with a portfolio that includes the brands “Sol” and “Go Power!”, means they now have offices in Toronto, Florida, Finland, Germany, Singapore, Russia and the United Kingdom. With an impressive global reputation like Carmanah’s, it makes you wonder what’s happening behind the scenes to keep the team creative and fueled with positivity. In addition to this, they have an active social committee that organizes pancake breakfasts, BBQS and even the occasional games day or sporting event. Last year Carmanah raised $8,658.70 (plus food donations) for the local Mustard Seed Foundation through the VIATEC Food Bank Challenge. Carmanah is looking forward to celebrating their 20th anniversary next year (follow them on Twitter to stay tuned on the event), but they’re more excited to be a part of a market which is primed for growth. 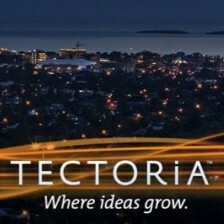 The path ahead looks clear and bright for Carmanah Technologies and Tectoria couldn’t be more proud.